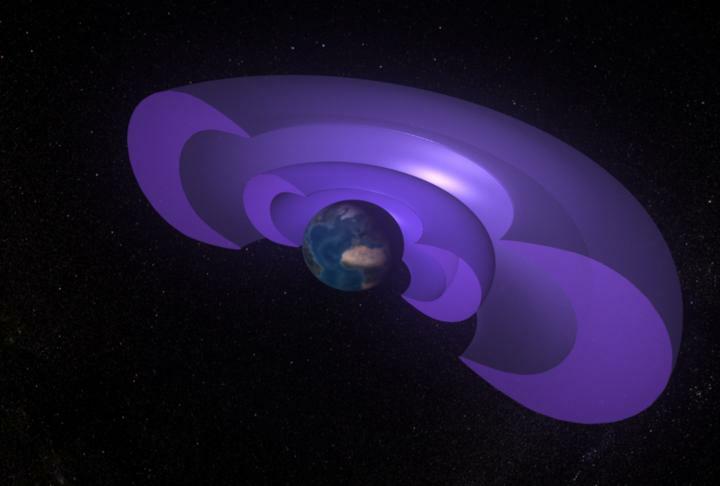 LOS ALAMOS, N.M., April 9, 2019– A new, first-of-its-kind space weather model reliably predicts space storms of high-energy particles that are harmful to many satellites and spacecraft orbiting in the Earth’s outer radiation belt. A paper recently published in the journal Space Weather details how the model can accurately give a one-day warning prior to a space storm of ultra-high-speed electrons, often referred to as “killer” electrons because of the damage they can do to spacecraft such as navigation, communications, and weather monitoring satellites. This is the first time researchers have successfully predicted those killer electrons across the whole outer belt region. At the Earth’s equator, the outer radiation belt–also called the outer Van Allen belt–begins approximately 8,000 miles above the Earth and ends beyond 30,000 miles. High-speed high-energy electrons inside this belt are known for their high variability, especially during solar storms, when new particles from the sun enter the Earth’s space environment–making them extremely difficult to predict. Funding: U.S. Department of Energy through Los Alamos National Laboratory’s Center of Space and Earth Science Program and Los Alamos National Laboratory internal funding, the NASA Heliophysics Guest Investigators Program, NASA Heliophysics Space Weather Operations to Research Program, NASA’s Prime contract no. NAS5-01072, and RBSP funding contract NNG13PJ05I.